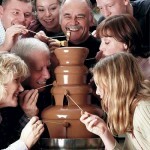 Imagine a flowing chocolate feast, where you can dip your favourite food into a cascade of warm Belgian chocolate. A chocolate fountain gives your guests a fantastic experience and creates an elegant focal point to your party and event.You can create your own desserts to dip in to the cascade of chocolate flowing from the top of the chocolate fountain. Choose your own dips – from strawberries and bananas to marshmallows and profiteroles and then prepare to create your own fantasy fondue! We use the very best Belgian chocolate – available in dark, milk and white . For wedding receptions and parties, for corporate events and product launches, make it special with the enticing aroma of the cascading chocolate fountain. Our friendly and professional staff will ensure that you receive the ultimate chocolate fountain experience. For prices and availability please click here. 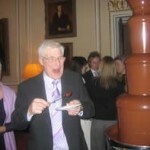 We provide chocolate fountains to clients across the country. We travel nationwide and regularly work in the following areas : Northamptonshire, Northampton, Kettering, Daventry, Corby, Towcester, Buckinghamshire, Aylesbury, Buckingham, High Wycombe, Marlow, Cambridgeshire, Cambridge, Huntingdon, Newmarket, Peterborough, Thetford, Bedfordshire, Bedford, Luton, Dunstable, Oxfordshire, Oxford, Banbury, Bicester, Newbury, Suffolk, Ipswich, Felixstowe, London (all areas), Essex, Brentwood, Chelmsford, Colchester, Epping, Harlow, Ilford, Waltham Abbey, Hertfordshire, Bishop’s Stortford, Borehamwood, Bushey, Hatfield, Hemel Hempstead, Hertford, Kings Langley, Letchworth, Potters Bar, St Albans, Stevenage, Watford, Welwyn Garden City, Middlesex, Edgware, Enfield, Harrow, Ruislip, Stanmore, Wembley.